The credit requirements for the VA home loan program are lenient. However, applicants must still meet the credit and income criteria established by the Department of Veteran Affairs (VA). While the VA has not set a minimum credit score requirement, most lenders typically impose their restrictions on qualifying FICO scores, and these restrictions have tightened since the real estate market collapse of 2007. 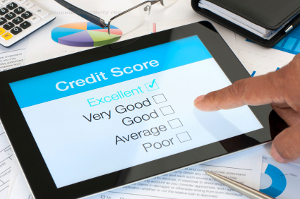 Today, most lenders expect a credit score of at least 620, though higher scores will secure the best mortgage rates. 580: Minimum credit score required for 100% financing. 620: Acceptable credit score for some mortgage lenders. 640: Typical minimum credit score required by most lenders. Although credit score does play a significant role in the application process for any loan, there are several other factors which can diminish an applicant’s chances of securing a loan. Applicants who have credit-damaging events such as bankruptcy or foreclosure may have difficulty qualifying, though they may still receive a VA loan under certain circumstances. In the process of approving a loan, the Department of Veteran Affairs will examine a borrower’s credit history, specifically history of payment. As with all loans, borrowers who have consistently paid on time for 12 months before applying for a VA loan will have a decent chance of securing a loan, as this demonstrates responsibility and willingness to fulfill financial obligations. By contrast, borrowers who frequently make late payments and accumulate delinquencies will find acquiring a VA loan to be a difficult endeavor as lenders will hesitate to offer a loan to a weak candidate. Although have no credit can occasionally present a problem when looking for a loan, borrowers with no credit history can still acquire a VA loan in some circumstances. When no credit history is available, lenders may accept alternate forms of credit to evaluate a borrower and determine an appropriate interest rate. These alternative forms include payments such as rent, utilities, cell phone bills, or any similar recurring payments. Chapter 7 Bankruptcy: According to VA guidelines, borrowers must wait a minimum of two years from the discharge date of the bankruptcy, not to be confused with the filing date. Lenders will require a thorough account and explanation of the bankruptcy be provided. Also, borrowers must have good credit standing and a steady income following the bankruptcy to qualify for a loan. Chapter 13 Bankruptcy: VA guidelines specify that borrowers still paying on a Chapter 13 Bankruptcy may still be considered for a VA loan if bankruptcy charges have been consistently and timely paid for at least a year. Additionally, borrowers seeking VA loans must acquire written endorsement from the court trustee before proceeding. As with Chapter 7 Bankruptcy, a full explanation of the circumstances of the bankruptcy will be necessary. Furthermore, borrowers must have established a good credit score following the bankruptcy and must qualify financially. For minor collections, the Department of Veteran Affairs will not require that the collections be paid as a prerequisite for VA loan approval. However, VA guidelines require that judgments be entirely paid off before the time of closing. Borrowers that possess delinquencies on any federal debt, including student loans, tax liens, etc., will be ineligible for a VA loan. Payment arrangements that can make a borrower current on payments may be acceptable during the approval process. In general, borrowers whose property has been foreclosed on or presented a deed-in-lieu of foreclosure must wait two years before reestablishing eligibility. However, this does not necessarily restore full entitlement when foreclosure involves a VA loan; to receive full entitlement, borrowers must repay the losses suffered by the VA as a result of the foreclosure. Once the loss is repaid in full, the VA borrower will have full entitlement renewed. Borrowers may also use their remaining entitlement to purchase a home. See your lender to calculate the amount of remaining entitlement you may use to qualify for a mortgage. According to VA regulations, borrowers must wait two years following a short sale before becoming eligible for a new VA mortgage loan. However, getting VA approval after a short sale requires that a borrower reestablishes good credit since the short sale event. Additionally, borrowers who have undergone a VA short sale will lose full entitlement to VA loan funds. Until the remaining balance on the short sale is paid in full, the borrower will not be able to secure as large of a loan. When considering these types of transactions, it is important to note that each lender has his or her policies and restrictions with regards to VA loans. Qualifying for a loan after a short sale, foreclosure, or bankruptcy rests entirely on the discretion of the lender, and thus borrowers should do as much as possible to raise credit before the loan application process, not only to improve the chances of qualifying but also to secure the best mortgage rates available. For circumstances not involving bankruptcy, credit may be satisfactorily re-established after payments are made consistently on time for 12 months following the date of the negative activity. When an underwriter examines a borrower’s credit, he or she will typically analyze the overall patterns that characterize a borrower’s credit history. This credit behavior thus weighs more heavily than isolated incidents of late payments or delinquencies. Thus borrowers who have undergone a period of financial hardship will not be harshly penalized if consistent payment has since been proven. After a credit-damaging event, it is essential to establish good credit to qualify for future loans and acquire the best available interest rates. Finding a VA Approved lender who will take the time to look at a borrower’s credit report extensively is very important when applying for a VA Loan with less-than-desirable credit. Lender411 has an extensive database of reputable VA Approved lenders who will make sure Veterans will receive their desired home loan while still taking credit score into account. If you are considering a VA loan, start shopping today by filling out Lender411's VA Request a Quote form on the top of the page. Get a Free Quote! Get a VA Loan!